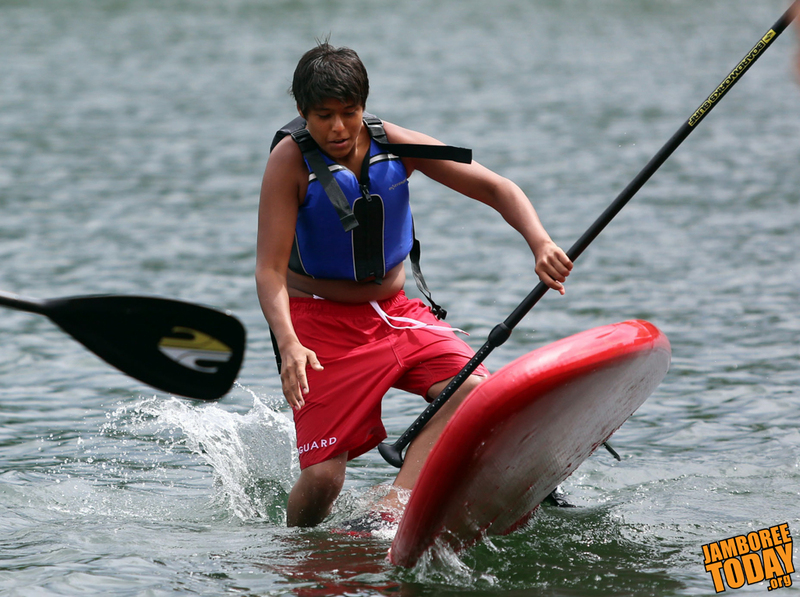 Paddle boarding is one of the newest aquatics activities offered at the National Scout Jamboree. Photo by Daniel M. Reck. As the Summit Bechtel Reserve offers the first ever Jamboree paddle-boarding program, chaplains and aquatics staff members gathered Monday morning to give their blessing and prayers for safety on the waterfront. Among the chaplains present were Eagle Scout Christopher Garcia, of Springfield, Va., Todd Delaney of Bristow, Va., and Eagle Scout John Wood of Dayton, Ohio, who all prayed for safety on the water during the 2013 National Scout Jamboree. 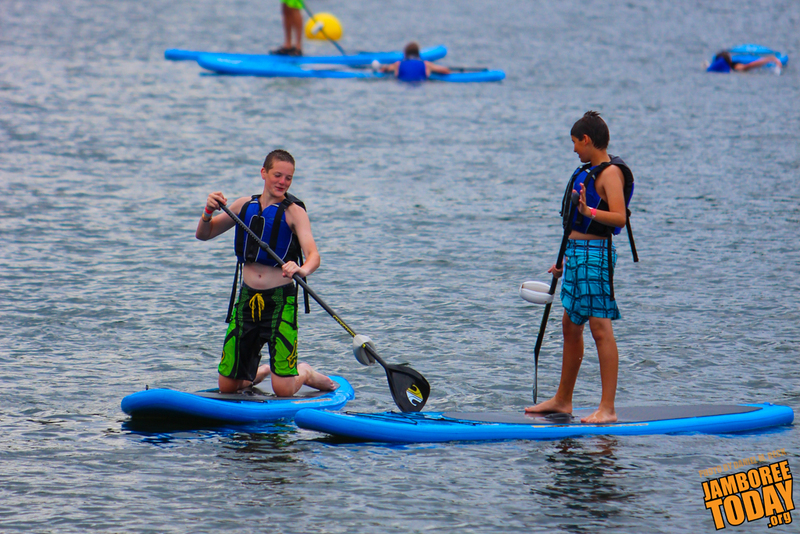 The paddle-boarding program, which is located on upper Goodrich Lake, is a walk-on activity that offers basic instruction before going out on the water, says aquatics staff member Frank Youdelman of Tuscon, Ariz.
"Our goal is to do 96 youth in 30 minutes," said Youdelman, which would allow over 10,000 participants onto the water over the course of the jamboree. All staff for the activity have been trained and certified by American Canoe Association CEO Christopher Stec, says Youdelman. The ACA is a non-profit organization that provides education in paddling activities, including canoeing, kayaking, and rafting. As Garcia and the other chaplains concluded their service, he left staff members with a simple piece of advice: "Get Wet!"